High efficiency and output : This solar panel module conversion efficiency can comes up to 20.5%-22.5%, Ideal output: 500W per day (depending on the availability of sunlight). It has excellent performance even in low-light environments. Durability : This panel is designed to withstand high wind and snow loads, offer weather-resistant outdoor durability and longer life span. Easy installation: compatible with Z-bracket mounting system and rail mounting system . Warranty:6-year material and workmanship warranty,25-year power output transfer warranty;friendly 24H/7D service. 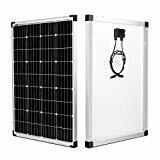 This 100 watt panel is made up of high quality monocrystalline solar cells, which provides you with the most efficiency per space. With industry standard MC4 connectors coming directly off the panel, connecting with other panels is easy to handle. Aluminum corrosion-resistant and waterproof construction is ideal for off-grid applications,which can be used for decades.Try it on RV’s, boats,vessel or wherever you needed!